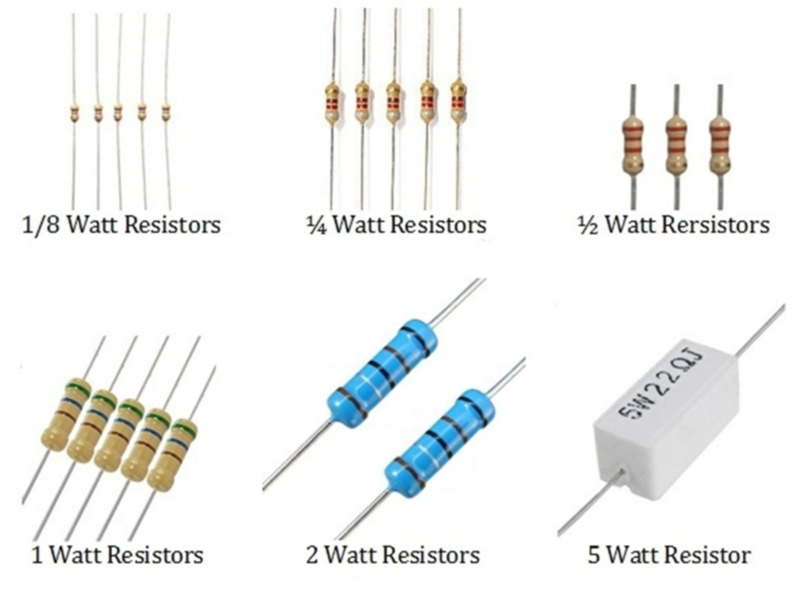 Resistors have a wide variety of applications in a circuit, although not all resistors are suitable for all applications. Resistors are selected using different parameters. The color codes help to read resistance, tolerance and voltage, apart from these three values, there is another important parameter required to use the resistance in a circuit, this is the rated power of a resistor. It is very important to use the resistor with the correct power in the circuit to prevent the circuit from being damaged. WHAT IS THE MEANING OF THE POWER CLASSIFICATION? It can be defined as the maximum power that a resistance can safely support without any damage, for this must be considered that the resistance dissipates the excess energy in the form of heat, therefore, the maximum power indicates the maximum heat that a resistance can dissipate safely. Increasing the power that the resistor can withstand will cause it to burn. HOW ARE THE RESISTORS CLASSIFIED? The power rating of the resistor is evaluated in watts, which are power units. In general, the higher the value of the resistor, the greater the power it can withstand. As the power of the resistor increases the cost it also does, the power values of the resistors generally start from 1/8 watt to many kilowatts. The power of the resistor can be seen when looking at the size of the resistor. HOW TO DETERMINE THE POWER OF THE RESISTOR? Therefore, power dissipation in a resistor can be calculated using any of the above expressed equations. The resistors that are designed to handle high power are called power resistors, the resistors with a nominal power of at least 5W of power have low resistors. The material used for the construction of power resistors must be of high thermal conductivity. These resistors are common, but they ca also be found in other types. If the wound resistors of nichrome alloy are used with a suitable non-conductive enamel paint, they can withstand temperatures of up to 450°C. The grid resistors are used to withstand large amounts of current, can withstand a current up to 500 A and can reach resistance values as low as 0.04ꭥ. The grid resistor construction includes two electrodes with large metal bands connected to each other in the form of a matrix. The grid resistors are used as earth resistors, braking resistors and harmonic filters for electrical substations. In the construction includes tubes that carry saline solution with electrodes connected at both ends of the tube, the concentration of saline or salt water will determine the resistor. Due to the presence of water in the tubes, the water heaters provide a large heat capacity, which in turn results in a high power dissipation. Power resistors can also be found in the form of surface mount devices. Due to its small size, the power dissipation capacity of the SMD resistors is lower than the resistors mentioned above. The engine brakes on heavy locomotives and trams use power resistors, the locomotives move at high speed and possess a high kinetic energy, when stopping these high-speed locomotives their kinetic energy is converted into heat, therefore, depending of the speed of the locomotives, the amount of heat generated can be of the order of few kilowatts. Classic disc brakes cannot be used as they wear easily, therefore, regenerative brakes or high-power resistors in the form of grid resistances are used in locomotives. They are used as grounding resistors to limit fault currents, high voltages and act as protection relays. They are used as charge resistors in turbines and uninterruptible power supplies. They can be designed to provide a power of up to 6 megawatts, due to this high power dissipation, the charge resistors are equipped with an efficient cooling system to control the temperature and prevent the devices from burning.